EU Energy Ministers agreed on the Council General Approach for the post-2020 RED II. 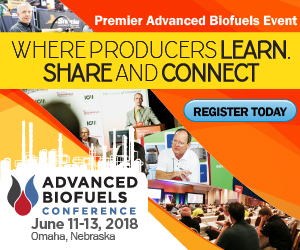 Biodiesel stakeholders welcome boosting renewable energy in transport 10 to 14 percent from 2020-'30 and keeping a 7 percent crop-based biofuel cap through 2030. The round robin test offers the opportunity to perform an external independent quality assurance for analytics of pharmaceutical glycerol. Company and commercial service labs can validate their own measuring performance and verify the used methods. ASTM International has officially announced that Scott Fenwick, technical director for the National Biodiesel Board, has been elected as the next chairman of the Committee D02 on Petroleum Products, Liquid Fuels, and Lubricants. Environment and Climate Change Canada released its preliminary Clean Fuel Standard regulatory framework, serving as a critical step to achieve the Canadian government's commitment to reduce greenhouse gas emissions by 30 megatonnes by 2030. Illinois-based agricultural cooperative Growmark Inc. is now providing biodiesel-blended Top Tier Diesel Fuel. The Top Tier Diesel Performance Standard was developed by a consortium of OEMs to benefit owners of diesel-powered vehicles and equipment.